Start of the inaugural KR500 in Hamilton. The Kiwi Rider 500 was nominally New Zealand's first adventure ride. I say nominally because though I used the term to promote my dream of running a long distance on/off road event, the KR500 was not the first event of its type. In some respects the KR 500 was modeled on the Shell 500 and other similar road trials that had been popular for decades throughout NZ. Consider that most regular road trips in the early day of motorcycling in NZ were often in fact quite stern adventures. Even well into the 1960s travel outside any city would often include gravel roads, often with slippery wooden bridges or un-bridged fords. The decision to use the word adventure came later when it seemed the ideal way to label a ride that would include the elements of riding that I loved; back country, trail riding, navigation, scenery and friendship. The KR 500 differed from the earlier road trials with the inclusion of extensive off road sections. This scene from the 1992 KR 500 in the Tarawera Forest. The route included long stretches of windy gravel road, a few clay tracks and plenty of gravel forest roads. 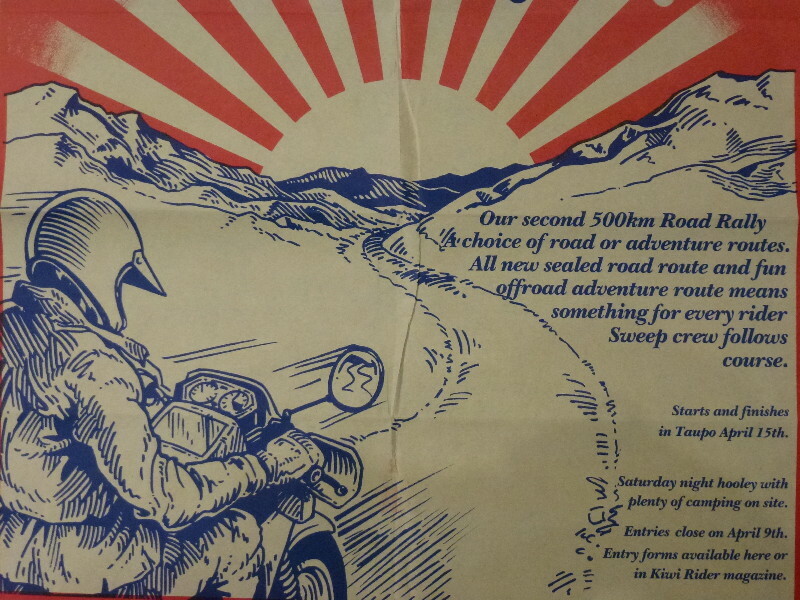 The first KR 500 was run in 1989 on a full one-day 500km route from Hamilton to Taupo . This was an ambitious course because the route included long stretches of windy gravel road, a few clay tracks and plenty of rough forest roads. As anyone who has done a ride like this knows, averaging even 60kph in these conditions takes some skill and dedication to forward momentum. With even minimal breaks for fuel and food riders were looking at at least 10 hours in the saddle. What may have been different about the KR 500 was the deliberate inclusion of optional road and adventure routes. Though both routes shared the general direction of travel and some gravel was included even on the road route, several off road sections were mapped into the adventure route, including farmland, native bush and pine forest tracks. In some respects the KR 500 was modeled on the Shell 500 and other similar road trials. The Blue Wing Honda sposored Domintor mark-out bike was much appreciated. Unfortunately these leathers have since shrunk alarmingly, though sound in all other respects. Blue Wing Honda agreed to sponsor the inaugural KR 500. The package included use one of the then new Honda Dominators to plan and mark out the dual road and adventure routes. I spent a couple of weeks plotting and route sheeting the course and found the Dominator to be a great machine for the job - interestingly, much as it still is and evidenced by some of the Dominators that that still give good use adventuring today. KR partner Pete McPhee and I then spent a less thrilling two days cross checking both routes from the relative comfort of a Ford Sierra, discovering at the same time that a car travels almost 10% further than a bike on the same windy gravel road. The birth of the classic kiwi adventure navigation system. 1989 KR 500 route sheet. The KR 500 route instructions were a modified version of the road trial tulip style instructions laid out to a three column A4 format to fit sufficient instructions on a sheet. For the actual ride someone (I believe it may have been John Forsyth?) came up with the idea of cutting the three columns into one continuous strip and mounting this in a rolling route sheet holder. Thus the classic kiwi adventure ride system complete with home-made click-clack lunchbox route sheet holder was born and survives to this day. One of the features of John's roller that I vividly remember were the roller extensions made from Waikato beer bottle tops - perfect grip and a constant reminder what could be looked forward to at the end of the ride. 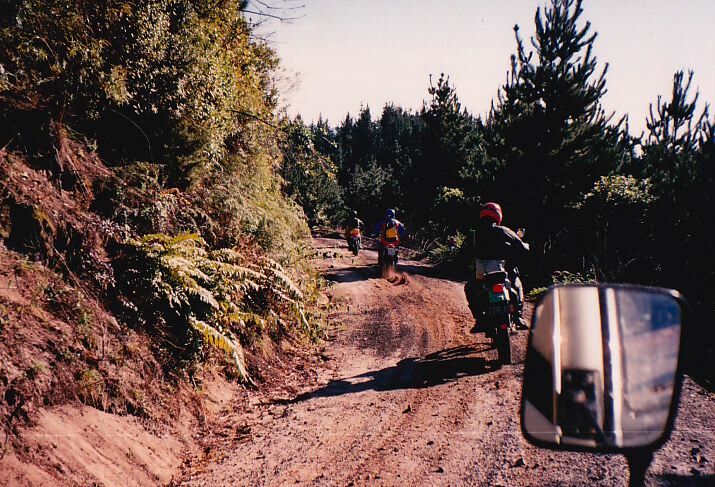 The inaugural route started outside Scobie Honda and riders soon made their way westwards to the Raglan area and the windy gravel roads that the riders would be hard at all day. After a fuel stop at Raglan the route led around Mts Karioi and Pirongia to Kahwia and on through the limestone country to the south. After lunch the route swung east towards Te Awamutu to skirt the Rangitoto Range before plunging into Pureora forest via private farm properties. Continuing through the southern blocks of Pureora Forest the riders headed east again chasing the last of the daylight to the finish near Taupo. Riders were expected to maintain set average speeds for various sections of the route depending on how tight the road conditions were. Checkpoints were set up at various points unknown to the riders and points were lost for early and late arrival. There were over 100 entrants who comprised a mixed bunch of ex road trialits, future adventure riders and even a good sprinkling of enduro specialists who were then familiar with the concept of riding to and average speed, albeit over somewhat sterner terrain. Unfortunately I have mislaid the official results of the event. However I don't think this was all-important as the competitive aspect of the ride paled into insignificance when gauged against the overall effect achieved. The thrill and challenge of navigating and riding back-country roads and tracks in company with fellow enthusiasts and completing the full course were the essential ingredients. It was this ethos plus the social aspects of the ride: a shared lunch, prize-giving dinner and breakfast, that were carried forward. Though the KR 500 title was added to some of my later rides into the late 90s, I count the early events, 1989 Hamilton/ Taupo, 1990 Taupo and 1991 Rerewhakaitu, as the heyday of this ride. The instant success of the KR500 did however point to the potential of adventure riding and paved the way forward for many more adventures.